"In a world full of digital diversions, how are some people able to achieve a higher level of productivity than others? 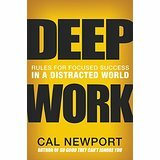 In the new book Deep Work: Rules for Focused Success in a Distracted World, Georgetown University professor Cal Newport demonstrates how you can develop the skills necessary to focus at an optimum level and reach peak productivity. Learning how to do “deep work,” he argues, is among the most valuable skills people can learn, and carries wider implications for economic growth."